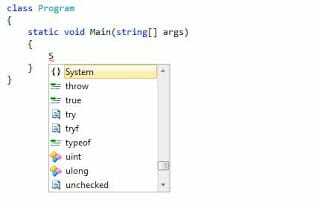 Perhaps one of the most important feature of the Visual Studio family is the IntelliSense. IntelliSense serves as an auto completion tool as well as a quick reference for classes, methods, and many more. I remember using an old IDE for C++ and I have to memorize the necessary codes I have to use. With IntelliSense, I learn as I type because you actually see a brief description of each components describing how to use them. IntelliSense is activated the moment you type a letter in the Code Editor. Type the following code inside the Main method of the program. Typing the first letter of the statement automatically activates IntelliSense. IntelliSense gives you a list of recommendations with the most relevant one on the first of the list. You can press tab to accept the selected recommendation. Typing a dot will bring you another list of recommendations. The list is based on all the components that are contained inside the preceding namespace. If you stay the selection for a short amount of time, the description about the selected item will show up. This allows you to learn what each item does without going to the full documentation. As you type the code, the list is narrowed down. 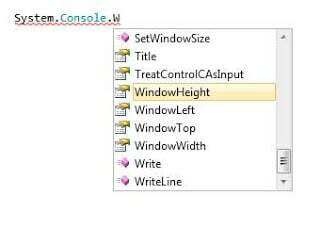 For example, typing the letter W make IntelliSense to only show items with W’s in it. Typing more letters will narrow the list even further. If IntelliSense cannot find something that matches what you are typing, then nothing will be shown. You can press Ctrl while a list is shown to make the list transparent. It’s useful when the list box is blocking some of your codes. When working with methods with multiple overloads(versions), you can use the arrow heads to see all the possible overloads of the method. You will also see the different parameters required by the method and their individual descriptions. Methods and parameters will be discussed in a later lesson. IntelliSense is such a great feature, and for every release of Visual Studio, IntelliSense becomes even more intelligent in suggesting codes for you. It is one of the time-saving tools Visual Studio offers.